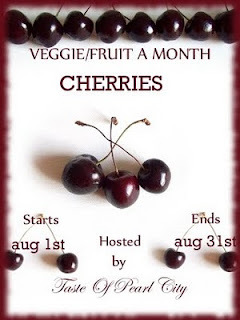 Lecker and Yummy Recipes: Cherry on the Top ! Do you really need a recipe for this ???? Canned Prunus cerasus( the sour cherry) for the toppings. If you have time you could spoon the whipped cream over the half-cut peaches (which is hollow in the middle)and garnish with cherries or nuts. This quick and easy Peach salad goes to Veggie/Fruit a month, hosted by Taste of Pearl City, started by Priya and also to Iftar Moments. Ayeesha, deine deutsch is sehr Gut !